This simple extension provides an external debug message log server for GameMaker Studio and GameMaker Studio 2 games. Seeing the debug messages when not running the game from IDE (e.g. when testing multiple instances of multiplayer games). Have multiple game instances send messages to the same log (also good for debugging multiplayer). Constantly logging data without worrying about overflowing the output log. Logging data on platforms with broken logging (e.g. OSX). Having persistent log between game launches. Add the extension to your project (right click on extension - Add Existing - pick the .gmez file). Add the included files from extension to your project. These are marked to not be included in any builds by default. Somewhere on game start, add netlog_init("<server ip>", <server port>);. e.g. to connect to the same computer on default port you would do netlog_init("127.0.0.1", 5101);. Omitting this will display netlog(_) messages via show_debug_message(_) instead. 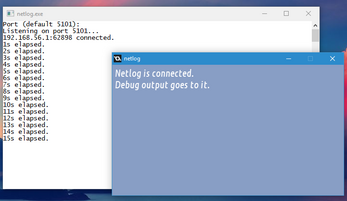 Add a "Async - Networking" event to any persistent controller object and add netlog_async_net(); there. 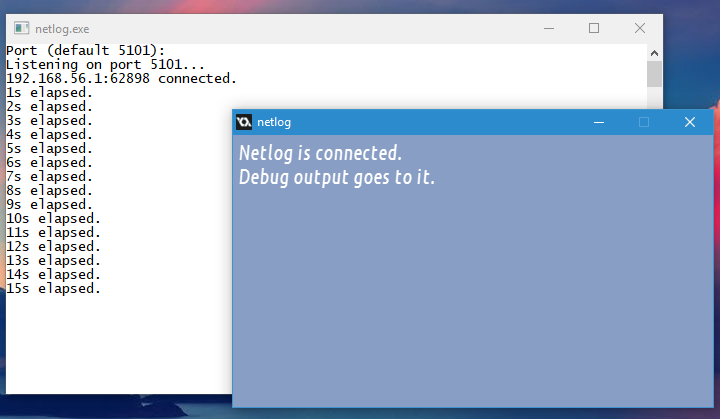 When you need to display debug information, use netlog("<message>");. If you already have a custom debug log function, may very well add the call to there. If using GMS2 macOS, install Neko VM runtime (Windows version uses .NET runtime). GMS1: Double-click "netlog.exe" in Included Files to start up the program. GMS2 Windows: Right-click "netlog.exe" in Included Files and pick "Edit". GMS2 macOS: Right-click "netlog.n" in Included Files, pick "Open in Explorer/Finder (Ctrl+Shift+O)". Open terminal in that directory and do "neko netlog.n".